Use my Total Technology Selling SystemTM to close more sales now with the ultimate program used by internationally renowned technology companies. You too can be closing more technology products and services deals in less time, with no sales experience (yes, you read that right and if know technology sales I will catapult you to the next level!) and be making more money faster than you ever thought possible!" 7 Part Mini-Course on How to Make More Money Selling Your Technology Based Products and Services! Proven Sales Methods that Deliver Results!" Please fill out this form to get your free Mini-Course! I will never share your email address with anyone! Are you struggling to close more business in your technology based company? Do you have a great technology product or service but aren't sure how to let prospects know about you? Are you frustrated with your current marketing and sales efforts for your technology based business and looking for fresh, new and unique ways to promote your business? Do you see your competitors growing and wonder what they are doing to be so successful (even when you know their product or service isn't nearly as good as yours)? Unfortunately, too many technology based businesses and professionals have strong technical skills, but don't know how to attract new clients! This is a common problem that I hear over and over again. "Data Safe Services of Whippany, New Jersey is a information security solutions provider that was technically able, but crippled when it came to the sales process. 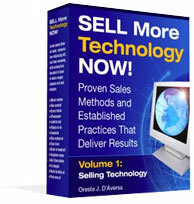 Utilizing the consulting services and training materials of SELL More Technology NOW! has resulted in better planning, execution and measurement of the sales process. The low-cost marketing ideas, example templates and processes look at technology sales from the entire life-cycle. I personally enjoyed working with Rusty as he is a highly motivated and business focused consultant. The value is measured in more sales for my company - Great Job!" Frustrated with your inability to attract new clients. Tired of networking with little or no results. Discouraged because you can't seem to turn interested prospects into paying clients. Annoyed because you're not getting the type or size of deals you had hoped for. Puzzled as to what marketing and sales tactics you should be using and how to use them. Confused because you are just starting out and don't know how to get your first clients. I've even known a few technology based businesses and sales people that became so frustrated that they called it quits! Contact me today at 201-483-8660 to get your FREE Marketing and Sales Analysis (a $200 Value). Learn your strengths and areas that need improvement so you can start closing more business, generating more revenue and have more job satisfaction immediately! "...packed with actionable sales advice..."
"Your presentation was packed with actionable sales advice - not sales theories." Get Your Contracts Signed Faster!" "Your book is exceptional, I’ve personally read the copy you gave me and it held my interest from beginning to end as it covered not just a few but all of the formulas needed to successful prospecting and selling. I would say “Thumbs Up”, we certainly recommend you as a fantastic speaker. " Copyright © 2006, SELL More Technology NOW!. All rights reserved.